Whenever E wakes in the night to tell us that she’s scared of monsters, spiders, or a Backson (thanks Winnie the Pooh) we tell her that we’re nearby and that ‘mummy and daddy won’t let anything bad happen to you’. This shooting in Las Vegas just makes me realise that of course that’s a promise that is impossible for us to keep. Pain and hurt and fear and disappointment will inevitably be part of our kids’ lives, and I need to remember that it’s not our job to protect them from it, but rather to ‘assure them that when the turbulence comes, we will all hold hands and get through it together’ (and keep serving the peanuts!). On a happier note, we got out for a family bushwalk at Tidbinbilla and it was great. 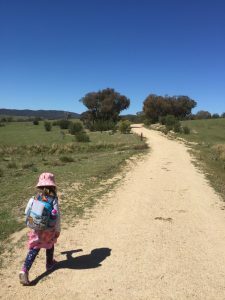 I’ve mentioned it before, but bushwalking is really my happy place and it’s so nice to be sharing this with E. I listened to a recent episode of the Australian Hiker podcast on hiking with kids (#40) and used some of the tips on this most recent outing – getting E to be the guide, hold the map and look for the trail markers, and to carry her own water and snacks. She really took to the leader role (which won’t be a surprise to anyone that knows her) and managed to walk 3.3km herself (although there was a fair bit of whinging at the end and we had to pull out the promise of an icecream). …one of my biggest takeaways was that we shouldn’t lie to children when they are asking us about grown-up words or ideas — otherwise, they will just ask Siri. If it’s between YouTube and me to explain prostitution, I pick me. Part of supporting kids through hard stuff is being honest (in an age-appropriate way). While I try to avoid lying to E (as I know she’ll figure it out eventually and I want us to have a relationship that has a strong foundation of trust), I find it difficult to find truthful and acceptable alternatives to ‘we won’t let anything bad happen’, and the more innocent ‘I don’t know where that picture/bag/toy is’ (when it ended up in the bin during last night’s clean up)! This piece has prompted me to pay more attention to those moments duing my day where I have to make a choice about honesty. This is my latest podcast discovery (thanks to Carly Findlay’s recommendation). I started with the latest episode (#14 – Best Friends Forever) and I’ve been thinking about it for days. It made me cry and reflect and filled me with gratitude for the wonderful friendships in my life. I’m now making my way through the back catalogue. Such a great podcast about love and loss and the hard and beautiful parts of being human. Most of us, I think, have had this experience: behaving quite differently according to the people in the room at the time. With some people we feel in perpetual shadow; with others, the sunlight seems to angle in and we are aglow. This piece by Richard Glover was published almost 5 years ago, but it’s one that I think and talk about often. This week it came up twice in conversations, so I thought it was worth sharing here too.